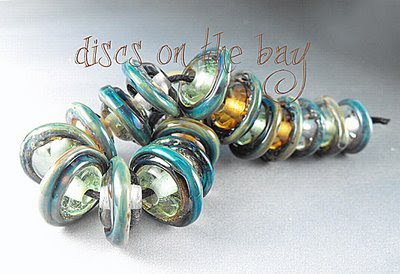 § 10 Responses to >latest from the studio..
>Beautiful!Those will make some wonderful jewelry! >Thank you both of you for the lovely comments ♥ you make my day! >Those look cool. Love the shimmering effect! >Glass gorgeousness by Deborah– always pleasing to the eyes! >Wow, those are really cool! So different from other discs that I have seen. >Love your work..:). I hope to do lampworking one day…!! Your work is a great inspiration..
« >Happy St Paddy’s Day all! You are currently reading >latest from the studio.. at fireandglass.